Greeks In The Streets 5K. 8:00 am ET. Langford Green, Florida State University, Tallahassee, FL. Online registration at active.com. Gulf Coast Community College Commodore Sun Run 10K / 5K / Fun Run. 6:30 am CT. Aaron Bessant Park (at Pier Park), 500 West Park Drive, Panama City, FL. Online registration at active.com. At the Leon County Commission meeting on Tuesday, 26 May 2009, the Gulf Winds Track Club presented a check for $10,000 to the Leon County Division of Parks and Recreation, funds to be used toward the creation of a cross-country running course in Apalachee Regional Park. Gulf Winds Track Club was represented by its president, Judy Alexander, and her husband Brian Corbin, while Pat Plocek was at the meeting representing Parks and Recreation. All were introduced by County Commissioner Brian Desloge. Leon County is partnering with the Gulf Winds Track Club and Florida State University in constructing the new cross-country running course on the county's property at Apalachee Regional Park, located east of Tallahassee on US 27 at 7550 Apalachee Parkway. Brian Corbin and Florida State University track coach Bob Braman laid out the trail, sometimes following fields and old roads, sometimes hacking out a rude trail through the jungle. County workers came later, widening and clearing the route. A volunteer work crew including Gulf Winds Track Club members and runners from the Florida State University cross-country team did additional trail work on 23 May 2009. Although runners couldn't race there today, the Apalachee Regional Park course should be ready for the Florida State University Invitational Cross-Country Meet on 10 October 2009. Beyond that date, the partners plan to continue to improve the facility until it is one of the best in Florida and the southeast. If you've run a number of cross-country races, then you've probably run course in a variety of areas, possibly including parks, golf courses, horse tracks, forests, military bases, farm land, and school campuses. Essentially, you ended up running wherever the race director was able to find enough open area to lay out a course of appropriate length, perhaps also with adequate parking and a sufficient number of restrooms. One place you probably haven't run, though, is a course solely for cross-country running. And that's a problem. Whenever you run in an area whose primary use is something other than running, there is going to be tension with the primary users. I've raced on a lot of golf courses, for example, and I can't remember a single golfer who was happy to see us. I can understand that; I'd be somewhat resentful myself if there was a putting contest at the track on a day I wanted to run intervals. There are similar problems with multi-use facilities like parks. Running may indeed be one of the uses the land is set aside for, but non-runners may also be trying to use the same area for horseback riding, dog walking, kite flying, turkey hunting, or some other activity that's allowed on public land. In many other sports this isn't a problem. Fields are set aside in parks for softball, baseball, soccer, and football. Likewise you can find tennis courts and basketball courts in many parks. There aren't many cross-country running parks, however. One of the few is Kansas University's Rim Rock Farm. Rim Rock was the property of Kansas track coach Bob Timmons, who spent a quarter century developing the land as a venue for cross-country races. It has been the home course of the Kansas Jayhawks' cross-country teams since 1974. In 2005, Timmons and his wife, Pat, donated Rim Rock Farm to the Kansas University Endowment Association, intending for the land to host cross-country races in perpetuity. Rim Rock Farm is reputedly a beautiful place to run cross country, the hills and woodlands being adorned with covered bridges and cast-iron silhouettes of great Kansas distance runners of the past. Because the site is devoted solely to running, signs and course marking can be permanent. Leon County may be the home of the next cross-country running park. The Leon County Division of Parks and Recreation is partnering with Florida State University and the Gulf Winds Track Club to develop part of Apalachee Regional Park as a dedicated cross-country running course. Apalachee Regional Park is east of Tallahassee on US 27 at 7550 Apalachee Parkway, the location of what was formerly the Leon County landfill. It's an attractive chunk of land, located on the south rim of Lake Lafayette. There are long-term plans to have Apalachee Regional Park connect with Tom Brown Park and the Alford Greenway via the multi-use Lafayette Heritage Trail. Even given the land, though, there won't be any course without money and sweat. As an early installment on the sweat, Gulf Winds Track Club president Judy Alexander is organizing a work day at the course on Saturday, 23 May 2009 starting at 9:00 am ET. Contact her if you can donate a few hours of your time (850-383-1361, 850-321-6886 (mobile), jalexander98@comcast.net ). Usain Bolt sets record for 101 meters! Not really. And he really didn't set a world record for 150 meters in Manchester on 17 May 2009, but a world best, because the IAAF doesn't recognize records for odd distances like 150 meters. It was a sad day back during my dinosaur-infested youth when the IAAF withdrew recognition for all the non-metric distances except for the mile. With one memo, the records for the 100-yard dash and the two-mile run were gone, as well as records for scores of other events measured in imperial units. A lot of history was trashed, but the value of the remaining records was increased. Which is the point of my disenchantment with yesterday's 150-meter street dash. Bolt's 19.30 200-meter world record is impressive. His 9.69 100-meter world record is phenomenal. But 14.35 over 150 meters is just a circus stunt. Yes, the previous "record" for that distance had stood since 1983, but how many times has a 150-meter event been run since 1983? But in spite of my opinion, there is probably a promoter out there dreaming up a "record" run at 125 meters. Hey, it's one-eighth of a kilometer, and the perfect set-up for a one-sixth kilometer sprint (166.667 meters). Spam has arrived on Twitter, the microblogging site. On some days I get as many as three announcements that I am being followed by someone with a handle like "felecia1985" whose sole post is to inform the world that she has just posted some "NSFW" photos on an internet dating site (the URL follows). I suppose that I will get used to it. I did get used to the e-mail spam from the Nigerian refugees who needed my help transferring a widow's US$40,000,000 into a western bank. I also got used to the myspace.com "friend" requests from libidinous swimsuit models. I've even gotten used to the listings for World Run Day on active.com. Most runners have a better resource for finding out about local races, but active.com is not a bad resource to fall back on. It's especially useful if you're going to be on the road, looking for an out-of-town race. Granted, not all running events are listed on active.com, but you have to wonder about the competence of a race director who won't avail himself of a free listing on active.com. But in November, you might be fooled into thinking you've found a race when you see a listing for "World Run Day." Whether you are looking for a race in Bowling Green, Rapid City, or Atlanta, World Run Day will pop up. However, it's not a race. Instead, it's a kind of self-service running event. Go out and run wherever you want for the distance of your choosing, and then make a donation to whatever charity that you want to fund. Oh, but go ahead and register and pay the entry fee, and the "organizers" will send you your "World Run Day" T-shirt. It's annoying enough to think that you've found a November race only to discover that it's really only "World Run Day," but now it's creeping into the rest of the calendar. Last week, I stumbled onto listings for a "Mother's Day Run" which was actually just another self-service event that offered a "World Run Day" T-shirt. And now there are "Father's Day Run" listings--same deal. There are also World Run Day Prep Runs, just in case you need a tune-up run to get ready to buy another T-shirt. I doubt that active.com is going to put a stop to this, not while they can harp on the slogan "change the world, one step at time" while continuing to pocket their percentage of each registration fee. So I propose this. 9 November 2009 is the next World Run Day. On that date, go out and run if you feel like it, but as a bandit. Oh, go ahead and donate to the charity of your choice, if you feel so inclined. You can even buy yourself a nice shirt or something at a local running store. But if you hate spam as much as I do, please don't register for this "event." On a Saturday morning, 9 May 2009, I drove down from Cheaha Mountain into Anniston, Alabama for the Anniston Lions Club's 11th annual Run For Sight 5K. I was spending the weekend in Cheaha State Park, and it seemed like an interesting way of getting in a workout on the road. Certainly, I had heard nothing but positives about the Anniston Runners Club. The race was on the grounds of Fort McLellan, a former United States army base. McLellan is being converted to civillian use, but most of the military-era structures are still standing. You see mountains no matter which direction you look from McLellan, which might make you uneasy about hills on the course. However, most of the route is nearly flat. The only slope I noticed on the first mile was a downhill around the mile mark, which made me wonder where we had gained the elevation we were losing. There were a couple of gently climbs on the second mile. The third mile featured an actual uphill (preceded by an actual downhill), but the climbing was all over by the last half mile, and the rest of the course was flat or downhill. The course is scenic as well. Most of the first mile goes by wooded areas, parts of McLellan that have remained or returned to forest. The second mile swings past the McLellan track and then makes a circuit of Buckner Circle, lined with Mediterranean-style houses that must have been built as officers' quarters. The third mile continues past the Mediterannean architecture of Silver Chapel and the McLellan fire station, passes an attractive footbridge built during World War II by German prisoners of war, then continues through the park-like grounds of McLellan to return to the start and finish area near the Miller Sports Arena. The course was well marked, with arrows on the pavement and signs at each turn, and signs at each of the miles. Each intersection was staffed by a volunteer from the Lions Club, at each mile marker a worker called splits. Last but not least, the course was USATF certified (AL06013JD), so you knew that you were actually running a 5K. In the race, the overall championship went to defending champion and 2008 Pell City High School alumnus Matthew Brick, who broke his own course record with a 16:38.51 performance. Brick was almost two-and-a-half minutes ahead of his nearest challenger, Rick Hester (19:05.98), who finished ten seconds up on third-place runner Jay Lloyd. Top women's honors went to Jo Ann Fort, eleventh overall in 21:37.69 and almost a quarter-mile ahead of the women's runner up, Brooke Nelson (19th overall in 23:02.19). Robyn Talley (31st overall in 24:19.46) completed the women's top three. So far as amenities, the race T-shirt was an attractive top made of a "moisture management" fabric. There was plenty of fruit, water, and soda in the finish area, as well as McDonald's breakfast bicuits. A live band performed in Miller Gym prior to the start of the awards ceremony, which was under way by about 9:30 AM. At 137 finishers the Run For Sight is not a large race--certainly it's no Peachtree. 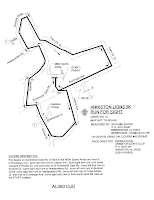 But the 2009 race was the eleventh annual, and if the Anniston Lions Club continues to put on a quality event there should be many more annual editions to come. USATF course certification map for the "Run For Sight 5K"
Melon Run 5K. Old Jefferson County High School gym, Monticello, FL. USATF certified course #FL06044DL. Online registration at active.com. A piece in the Okefenokee Track Club blog about the Shrimp Festival 5K in Fernandina Beach caught my eye, probably because it had some numbers in it. Specifically: "There were 516 total finishers, 276 of the runners being women." In other words, a majority of the finishers were women. This is interesting to anyone who was running back in the bad old days, when there were very few women running in road races. Even farther back, women were actively discouraged from running. Katherine Switzer's run at the 1967 Boston Marathon wasn't that long ago. Even though women make up a bit more than half the population, women were still over-represented at the Shrimp Festival 5K. Is this an anomaly? Are women still a minority in road racing? Or are women becoming represented in road races in proportion to their numbers in the overall population? Or is road racing becoming a women's sport, with men about to slip into the minority? The trend does seem to be toward a greater proportion of women participants. Of course, this is just one race. If someone looking for a doctorate in Recreation and Leisure Studies needed a research topic, they could see if this was a general trend in road racing. Or if it was dependent on the length of races. Or some sort of geographic variable. Or maybe all that research has already been done, and I'm behind the curve. Again.